We are not as excited as we should be about it because rumors of Google Play Music hitting the iOS have been out there for quite a few months. When Google Play Music All Access was first announced in May 2013, Android chief Sundar Pichai said that Google Play Music will be hitting iOS in a few weeks but we didn’t see it anywhere after months. The reasons of these delays is said to be because of some testing that is going on inside Google because it has to be free of bugs and other problems before launching it for iOS. Now the app is officially available on App Store. Google Play Music is a great app for enjoying music but now with Google Play Music All Access they are offering more than just listening to music. It gives you an unlimited access to Google Play Music catalog but for that u need to be subscribed. You can also listen to your music online and enjoy what you want to listen to on the go. The Google Play Music All Access came out this year and was available for all the Android phones out there instantly with free downloads. 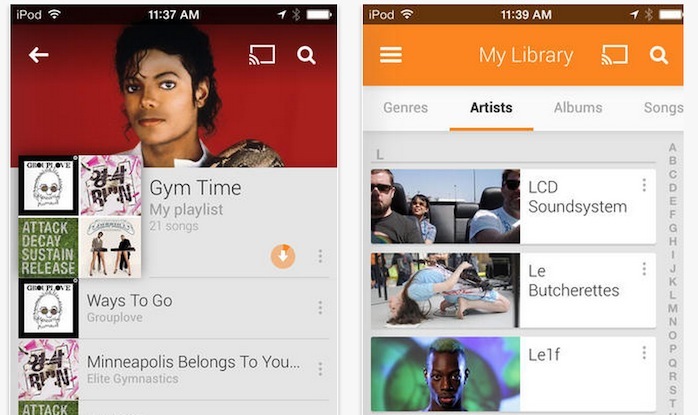 Google Play Music was only for Android and we didn’t see any support of it for other mobile platforms, but with the news that it’s coming out for iOS might be a good thing. For $9.99/month and a free 1-month trial, you will get unlimited access to millions of music tracks and Radio. Google is really stepping up when it comes to their app on iOS and we are excited to see how this app works and performs on iOS. Google now can compete fairly with other streaming services like Spotify or Rdio. Wow thats a great update from google store, i love these google play music store but the price for subscription is somewhat high.